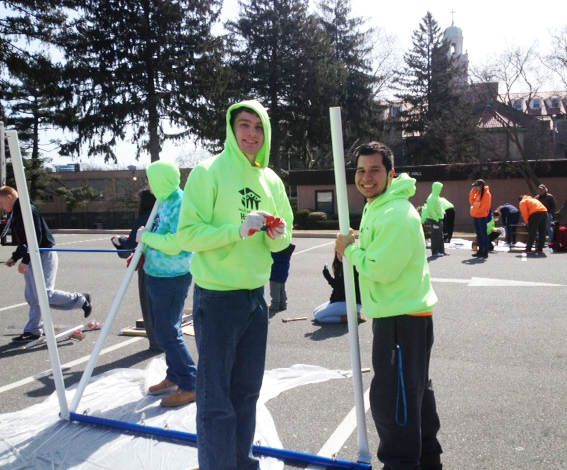 Holy Family University students Ryan Neumann-Domer (left) and Joel Contreras-Francisco build a swing set together on the university campus March 16. Students from Holy Family University and the University of Pennsylvania teamed up March 16 for a day-long event of service dedicated to Habitat for humanity. The students also accepted donations of goods for Habitat including furniture, rugs, lighting and other household items from the community. Both of the universities have official Habitat chapters on campus, two of only four campuses among all the colleges in the Philadelphia region. Two dozen Holy Family students spent their spring break in Spokane, Wash., earlier in March building homes for Habitat. PREVIOUS: Roman Catholic’s mock trial team finishes 2nd in Pa.